The Serena Bar Stool Black is the epitome of simple and sleek design, and can blend in harmoniously with other pieces of furniture. 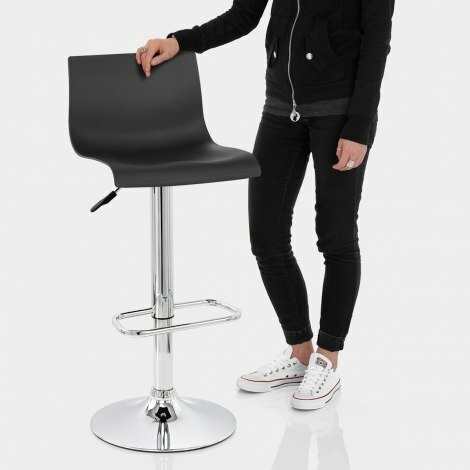 A fusion of modern materials and practicalities, the Serena Bar Stool is designed to astound you and your guests. The textured seat is formed from matt black resin that is comfortably curved for comfort, and its backrest provides lower back support for its owner. The seat has been mounted onto a chrome plated steel frame, with a rectangular footrest. 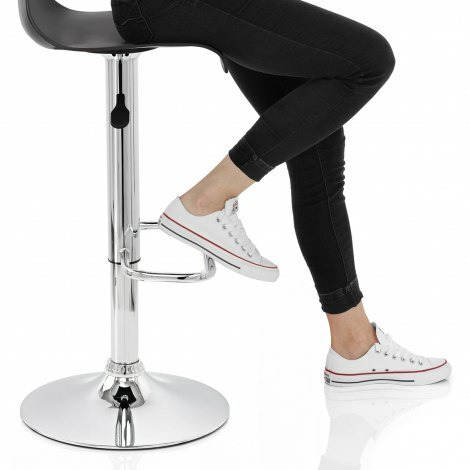 The bar stool comes with a gas lift mechanism, that not only allows for adjustable height but facilitates a 360 degree swivel action! To guard against damage, the circular chrome base, fitted with a protective rubber ring. "They are a very well made bar stool with a great design"
We purchased these after a recommendation from a friend for Atlantic Shopping. The bar stools look lovely in our new kitchen and were easy to put together, full instructions and a video on how to assemble them. Excellent delivery service. Would highly recommend the company and their products quality at a fraction of the price of high street retailers. Arrived on time well packaged. Easy to assemble. Very pleased overall very stylish. We're very pleased with these chairs. They are stylish and sturdy and look more expensive than they are. They are very comfortable - the chair supports your back so you can sit comfortably without hanging on to the breakfast bar. Even the children seem secure on them although they are not heavy enough to make them go down so need help adjusting the height. Useful tip - the instructions don't tell you to remove the black cap from the gas lift mechanism. You must do this or the stools don't go up and down. We had to dismantle, hammer out the stuck cap and start again.